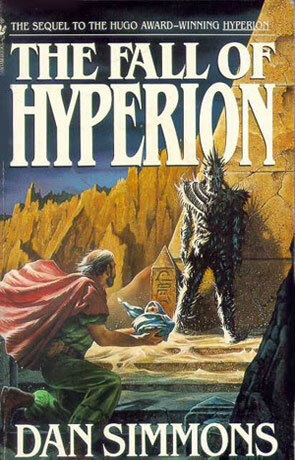 The Fall of Hyperion is the follow up novel to Hyperian (winner of the Hugo award) by Dan Simmons. I've been putting of writing this review for the last few days, hoping that time would make it easier for me to write it. Unfortunately I don't find it any easier to write now – but I'll try, giving up just because something is hard is not really the way to go is it? So why am I having problems reviewing this book? There's a couple of reasons, but the main reason is that Fall of Hyperion (FoH) is so well written that I feel unable to convey what I feel about it without reverting to cliches. Where Hyperion tales an interesting tale of the Time Tomb pilgrims, FoH expands and tells a much bigger story. Where I didn't hesitated at calling Hyperion a masterpiece, I now look back at it as mere warm-up to FoH. FoH takes of where Hyperion ended and finishes the tale of the pilgrims and answers our question about the Time Tombs, but at the same time the story expands to include to story of what happens to humanity of the farcaster web, the TechnoCore and the Ousters. Simmons writings are as full and as complex as in Hyperion – either of these books are easy reads, but they are both well worth the trouble. If you read and enjoyed Hyperion then this book is a must read.